Almost our entire life (as youngsters, adults, employees, businessmen, executives etc.) is paved with events that require proper attention from us. Sometimes our reaction to an event depends on our personal abilities, sometimes it is related to our mood at the time, and sometimes we feel, for some reason, as if we are taken over by dark and unfamiliar forces. They are uncomfortable and unpleasant but they are a fact. When an event occurs in a situation that is comfortable and pleasant for us, when we feel at home, our normal response repertoire will most probably provide a good result and even the most appropriate one. In such a situation we do not need to think too much and we do not feel pressure. Both sides to the dialogue understand one another, agree and approve that they can operate in full cooperation without damaging one another’s interests. The problem does not lay in situations in which everyone agrees with us: the bank manager agrees to our request to increase our credit line; the investor agrees to increase his investment in our idea by an additional thirty thousand Euro within two hours; or the operations manager informs us that he can deliver the urgent order immediately. The problems start when there is no agreement between the parties. When there is a heated argument or emotionally charged dialogue. In cases of a harsh exchanging of words, mutual accusations, misunderstanding of instructions or processes. The other party can be anyone: a work partner, a businessperson wishing to purchase products or services for their company, a CFO of a competing organization, the bank manager, your accountant or even your neighbour. Quarrels, conflicts or disagreements can burst out at any time and with anyone. Sometimes it will be with someone we do not meet with very often and sometimes with someone very close to us. Sometimes this may be with a person that does not have much influence and can do little harm and sometimes with a person who’s impact on us can be very bad. Any person caught into a situation that is problematic or difficult for them typically responds in one of three basic manners: ’run’, ‘attack’ or ‘freeze’. Under such circumstances, the rational, modern and advanced person returns to being the Neanderthal primitive beast and forgets all of their manners and political correctness. Anyone who has ever provided services to a client can tell of an event in which the client ‘lashed-out’ for no apparent reason and poured their wrath on the service representative – a behaviour which seemed without good cause. These outbursts can happen with no warning; sometimes they are preceded by silence: a roaring silence or an indrawn silence. On the surface nothing is visible. No sound can be heard. But inside the rage builds and accumulates until it is impossible to contain it any longer, and then the person attacks, freezes or ‘runs away’. Sometimes one other side causes this without noticing, they are so absorbed in their own things and interests that the interests of the other party simply do not exist for them. Sometimes the collision is structured within the dialogue itself between two different sides that may even be hostile to one another. These are situations in which the parties to the dialogue have different interests and sometimes quite opposite ones. These situations are common, for example, in the insurance field, the banking field, government offices and more. The interests of some will be different to or even opposing those of the business owner’s. Entrepreneurs, shareholders or company owners must thus know how to act in these situations and how to talk to the various role players. When a person becomes an entrepreneur, their own boss, or other people’s boss as part of their role as CEO or shareholder, they must be prepared for an increase in the number of the friction points, a rise in the number of controversial subjects and an overflow in the number of people they will need to communicate with and to settle differences with. This is exactly where the role of assertiveness begins. Assertiveness is a central work instrument in the successful management of all relationships and especially valuable to every entrepreneur (whether they have excellent ideas, are a business entrepreneur or an investor in a commercial start-up). A good definition of assertiveness is “decisiveness, confidence and a direct, resolved and firm style of speaking which enables a person to insist on what they need whilst still respecting the values and opinions of others”. It is the last part of the definition which makes the difference between ‘aggressive’ and ‘assertive’ , the key difference is that the aggressive person will simply demand something from another, the assertive person will be asking for the same thing but will be providing a reason for why they need it. Equally the assertive person will have an understandable reason for refusing a request (demand) made of them. Another, equally important, aspect of assertiveness is the ability of a person to ‘stand their own ground’ when dealing with another person and thus to obtain what they need whilst at the same time avoiding hurting the other person. This ability puts the business entrepreneur on a very interesting track, one in which their needs (or those of the business they represent) can be accepted to be at a higher priority than the needs and wishes of other people or organizations. As I have mentioned before, when there is no conflict of interests agreement is usually quickly reached and really assertiveness is not necessary. However, the more the event becomes complex and the more people, pressures, interests and factors are involved in it, the more difficult it becomes to either to say “no” or to get agreement to what is required. In many instances the higher ranking the executives a person is facing, then their basis of communication with the other side can become more narrow and their needs less aligned and thus the ability to say “no” or to say what they really need may decrease dramatically. This really emphases the need for preparation and a clear understanding of the ‘why’. A case that wonderfully demonstrates the above happened to an entrepreneur in the field of construction who arrived for a meeting at a bank with the branch manager. He thought he had prepared himself properly and memorized his arguments over and over. A minute before the meeting was about to start, he still confidently knew what he was going to demand from the branch manager. But then the door of the meeting room opened and when he was invited in he was faced with the CEO of the bank who had come to hear face-to-face the needs of preferred clients of the bank. After the fact, the man recollected that his verbal ability to present his demands to the general manager of the bank, the most important persona in the bank – had significantly dropped. He realized that although he had ‘practiced’ all his demands before the meeting with the branch manager he had not given enough attention to the ‘why’s and thus he had little ability to be assertive when he found himself sitting with the most high-ranking executive in the bank. A similar event occurred a few months ago when the president of a certain commercial company, a respected man with an amazingly distinguished appearance (there is no better way to describe him), found himself in an unusual situation. At a meeting held between the chairman of the employee union and the company’s CEO, the union chairman announced that the employees intend to initiate a strike and paralyze the whole company. A ‘coincidental’ (well-timed) entrance made by the company’s president at this meeting overturned the situation. The President explained without emotion why the company was unable to accept the union demands and what the effect would be on the company. The militant union chairman agreed to postpone the decision whether to strike for three months, during which the sides were able to reach an agreement. 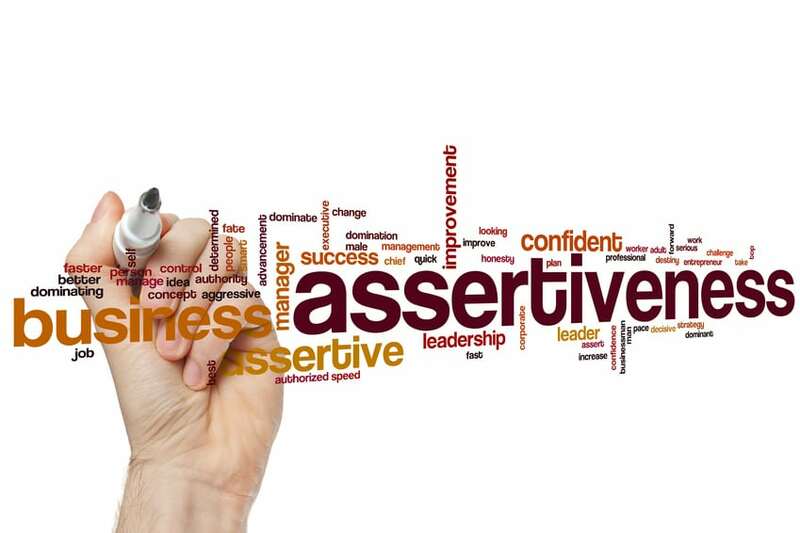 I would expect to find assertiveness in a response to improper behaviour in the business world (and at the same time in the world of entrepreneurship and all other aspects of life). Apparently, it seems that the business world runs according to a politically correct behavioural code, but reality shows that this world is also full of passion and anger and at times is infected by outbursts of verbal violence (not to mention unexpected physical violence). True, these cases are quite rare, but sometimes a difficult conversation can be held softly, considerately, with plenty of empathy and still be tough and uncompromising. In these cases (and even in more difficult events), assertiveness – meaning giving careful attention to the reasons for saying ‘yes’ or ‘no’ – is key to reaching a satisfactory conclusion.